The monks of the Abbey of Notre-Dame du Lac at Oka belong to the worldwide Order of Cistercians of the Strict Observance. In Canada and other places in the world they are commonly called Trappists. The Cistercian Order was founded in France in 1098 by a small group of monks from the Abbey of Molesme. Desiring a purer and more integral living of the Gospel and of the Rule of Saint Benedict, they headed off to a swampy plot of land called Cîteaux. There they struggled to live a communal life of prayer, sacred reading, and work, in an environment of poverty, solitude, and simplicity. The arrival of Saint Bernard and thirty companions at Cîteaux in 1112 assured the success of the new venture. Through Bernard’s influence the Cistercians grew rapidly and spread throughout the Europe of his day. The common name Trappist derives from a reform begun at the monastery of LaTrappe in France in 1656, under the leadership of Abbot Armand-Jean de Rancé. Seeking once more a purer living of the Rule of Saint Benedict, de Rancé initiated a series of observances that harkened back to the ascetic rigors of an earlier monasticism. In 1892, three congregations which followed his reforms were united to form the Order of Cistercians of the Strict Observance. In France, in the third quarter of the 19th century, the monks of the Abbey of Bellefontaine were seeking refuge away from anticlerical laws which were voted by the government. In view of securing their future in case of eviction from their monastery and even from their country, they founded in Canada a small monastery that could be used as a refuge if they were expelled from Bellefontaine. So, in 1881 was erected the very first monastery of Notre-Dame du Lac in the Province of Quebec at a small village by the name of Oka situated some 40 km north-west of the city of Montreal. The first monks were simply living in a small dwelling shown in the photo at the top of this page. Aftermath of the great fire of 1916The monks were offered a vast area of good land, by the Sulpicians, to start this foundation. 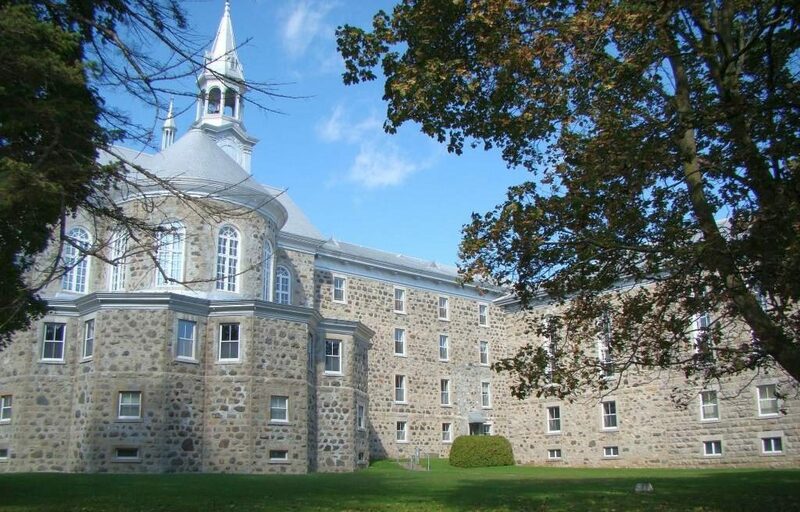 Established on the shores of lac des Deux-Montagnes this project prospered very rapidly into a large monastery but not without burning down twice; the first fire occurred in 1902 . In 1889 the monastery already counted 40 monks as members of the Cistercian Order in Oka. And in 1913, when Dom Pacôme Gaboury took over as second abbot, the monastery rapidly soared into prosperity. However, in 1916 all this work went up in flames as the monastery burned down for a second time.